I’m just finishing the Animation-Chapter of my German-speaking WPF book (WPF-Buch erscheint im Juni 2008). I had a hard time to find a good idea how to show the reader animations in a really "non-boring", but easy way. And I think I’ve found one. Of course, Animations in business applications must be placed in the right way. It’s not recommended to animate everything you can. If you do so, your application won’t be serious anymore. The application we are looking at here isn’t a business application. It’s just a small Loose XAML-File that allows you to become a soccer profi. :-) It show’s how animations are completely created in XAML and how they can be controlled. Animations in XAML are placed inside Triggers. Either in an EventTriggers Action-Property or in another Triggers EnterAction or ExitAction-Property. These Properties are all of type TriggerAction. The BeginStoryboard-class and some other classes derive from TriggerAction. BeginStoryboard contains a Storyboard. The Storyboard itself contains the Animations. Below a loose XAML. 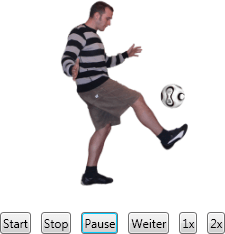 The Animation (bold) changes the Canvas.Top-Property of an image that contains a ball (the teamgeist-ball of worldcup 2006 Germany). The Animation starts, when a button with the Name btnStart is clicked. Between the ball-image the Canvas contains an image of me. And the clou is, it looks like I kick the ball for thousand times like a real profi.